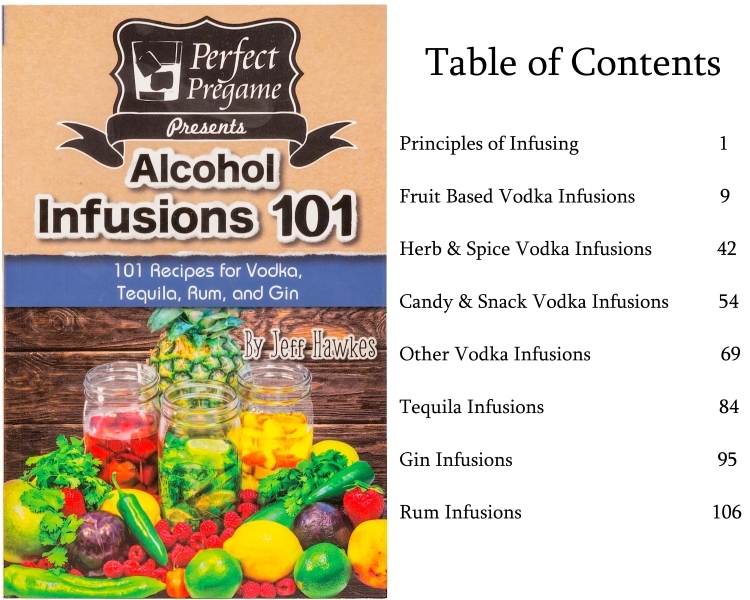 ALCOHOL INFUSIONS 101 – the centerpiece of this kit, Perfect Pregame’s Alcohol Infusions 101 not only contains 71 recipes for infused vodka, but 10 recipes each specifically tailored for making infused gin, rum, and tequila. 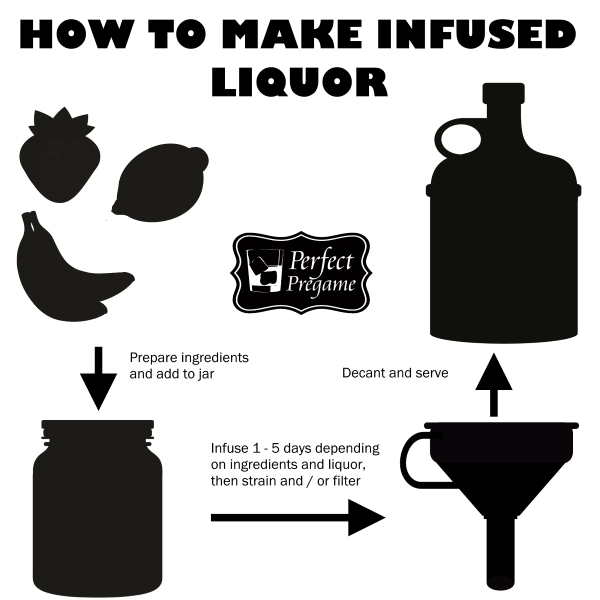 Each recipe also has a review to help you pick which infusions are right for you! 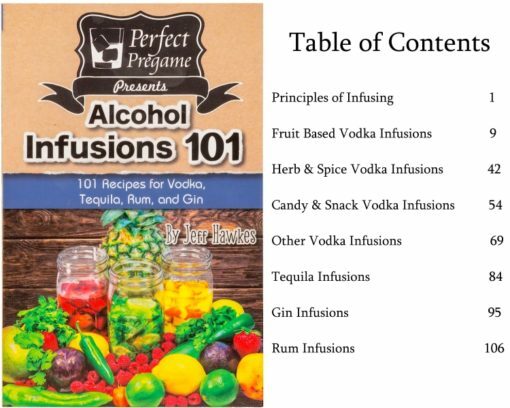 The book also explains the fundamentals of making infused liquors and contains the inspiration for hundreds more. EVERYTHING YOU NEED – in addition to the knowledge, this kit also contains all the tools you will need. This infusion set includes a 1000 ml (one quart) jar, a 750 mL moonshiner’s jug for serving your creations, a funnel and strainer insert, and a fine mesh filter. 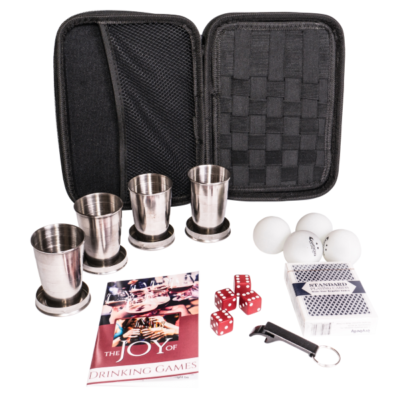 All of these items come in an elegant and secure box that make it an attractive gift. 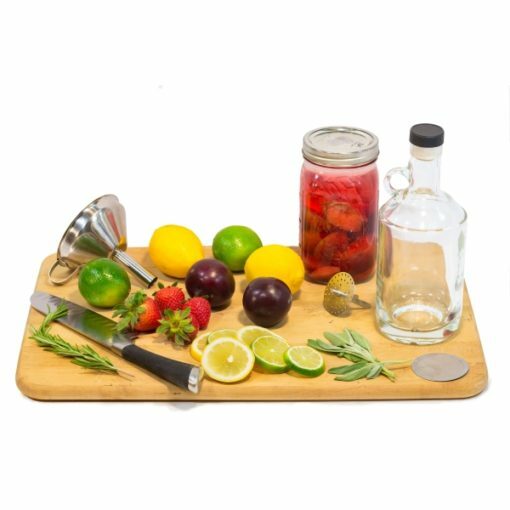 HOMEMADE INFUSIONS – it doesn’t matter if you are an absolute amateur or a seasoned mixologist, the tools and knowledge in this kit allow anyone to make their own homemade concoctions for use in craft cocktails or enjoyed on the rocks! 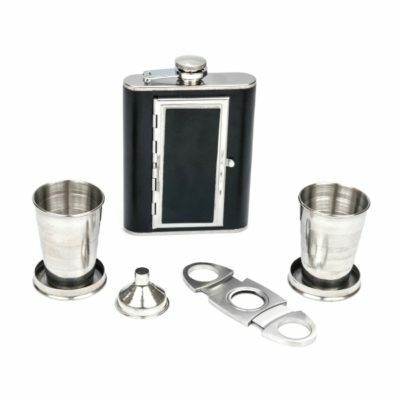 GREAT GIFT – for the alcohol enthusiast, DIY dynamo, or cocktail artist in your life, this set makes a perfect gift that you can guarantee they will enjoy using! LIFETIME GUARANTEE – you can rest easy when making this purchase. 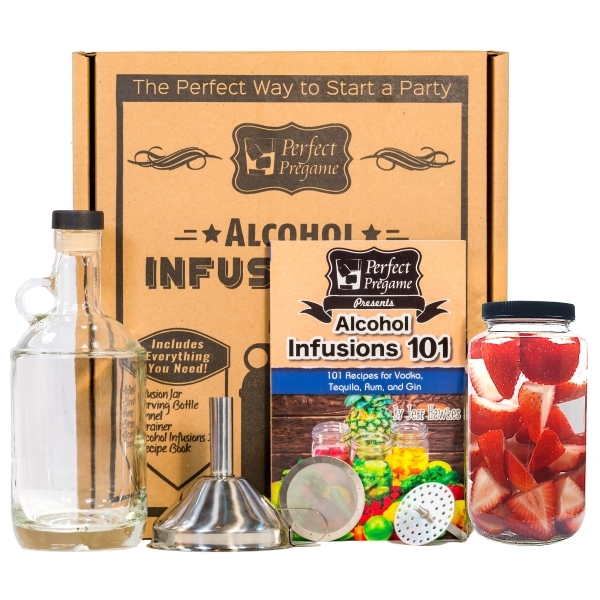 If for any reason you are ever not satisfied with Perfect Pregame’s Alcohol Infusion Kit, simply return it for a full, no questions asked refund. The components are manufactured in the USA and individually screened for quality before being hand-assembled into your kit. Your satisfaction is 100% guaranteed! Unleash your inner cocktail crafter – Order this alcohol infusion kit today! I’m not a big reviewer, but I had a lot of fun making my first batch and took some pics along the way, so thought I’d share my thoughts and some lessons learned. I ordered this because I like to make gifts for my family and friends each year for Christmas and this seemed like the perfect fit. I was impressed with the packaging. Nothing broken, exciting to open. I was even more excited when I discovered that the process only takes 2-3 days. Broken down into vodka, gin, and tequila infusions. The recipe book is surprisingly well thought-out. A nice intro, humorous commentary, and some delicious-sounding recipes. I do wish there had been a visual diagram of the parts and how they are used. 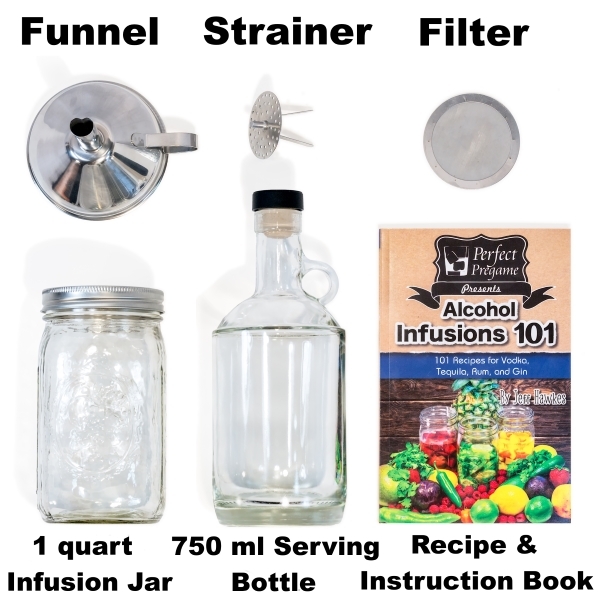 There aren’t many, but as a novice I found myself not knowing whether the infusion was to occur in the jar or the bottle, and there was something not listed that I later discovered to be a debris filter that fits in the funnel. For my first batch, I decided on a hybrid recipe that was a mix between a couple that were included in the recipe book. The result: lime, cilantro, jalapeño vodka. I realize this would have been a great tequila infusion…but tequila is not my fave. Plus I thought this concoction would make for an excellent Moscow Mule. The infusion process itself was very straight forward. Cut stuff up, put it in the jar, pour vodka on top. I’d say I was done with it in ~15 minutes. I used 3 limes, 2 jalapeños, and a half bunch of cilantro. Oh, and of course Tito’s vodka. 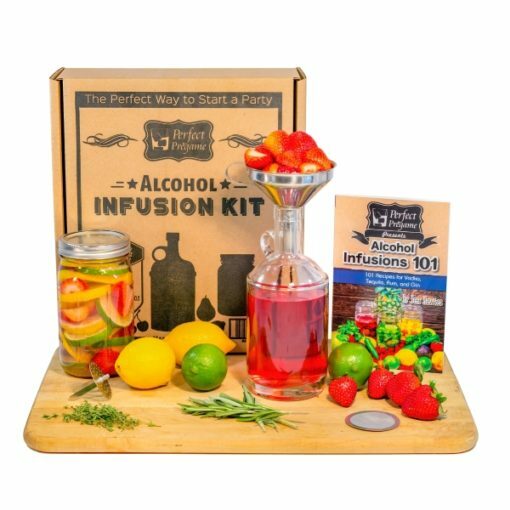 I purchased this because I’ve always wanted to try alcohol infusions! The best part about this system is that the seller provides 100+ recipes to try out. The book the seller provides is well written and humorous. I tried the mango habanero tequila for a wedding gift for my girlfriend’s sister and it was delicious! I’m excited to try new recipes and even adlib some of my own. Great product and good value, as well as customer service. I don’t know much about making my own anything really, so I was pleasantly surprised at the easy to follow instructions that came with this kit. And by the fact that I was able to make things that were actually potable despite my lack of experience. So far I’ve done two infusions, one traditional (fruit + vodka), one more exotic (candy + vodka). The book has helpful tips about what to start with and what you’ll probably like based on the type of drinker you are. There are also tips for how to vary recipes, so it does feel like you’re getting more than 101 and one recipes. The traditional recipes seem a bit more foolproof, and there are some I know I’m never going to be brave enough to try, but I still had a blast with both and I’m looking forward to playing around with the different recipes and methods and trying to maybe come up with my own creations. This is such a wonderful kit that makes infusions fun and easy. I use it primarily to add to home brewed cider and beer, but it is also great for cocktails. I have tried two recipes and modified a rum infused caramel instead of peppermint. 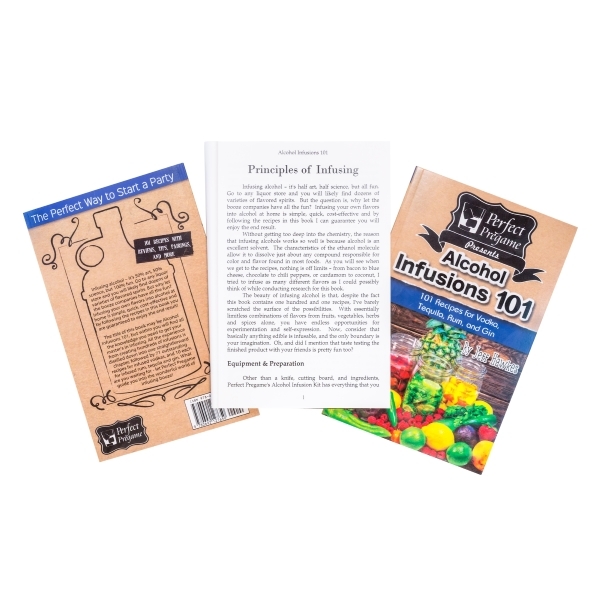 The tips on the recipe booklet are great for those infusions you wouldn’t necessarily think to try. Love this purchase and I would recommend it to any home brewer or home bartender. The recipe booklet itself is a goldmine of ideas and very interesting flavor combinations. I purchased this as a novelty gift for someone who has everything. It is a great idea for anyone 21 years or older. I bought this for a white elephant gift for a Holiday party with friends. We have some crafty beer makers and cocktail mixers in the crowd. It went over so well. The box was opened and we all got a good look, Quality was superb and the recipe book was a hit. I expect we will have many exotic drinks come from this kit in our future. Cheers!!! Used as a gift for my brother in law who loved it. Started with beer with apple cider then wanted to see what else I could do than apple cider beer. Then I came across this product and read about it knowing that this is exactly what I was looking for. Love this product!! !